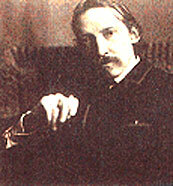 Robert Louis Stevenson (National Library of Scotland, Edinburgh) Born into a famous Edinburgh engineering family, Robert Louis Stevenson forsook a career as a lawyer to make his name as a writer, leaving behind the Victorian restrictions that had cramped his life in Edinburgh for freedom in London and Paris. Marriage to Fanny Osbourne in 1878 fired his creative genius in Treasure Island, Kidnapped, and The Strange Case of Dr. Jeckyll and Mr. Hyde, which have enthralled generations of readers. 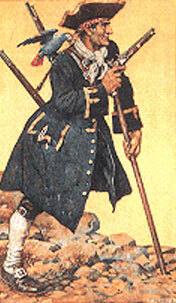 Long John Silver, an illustration from Treasure Island by Monroe Orr. Although a lively and energetic man, Stevenson was dogged by ill health, until he settled in Samoa where he gained a temporary respite. 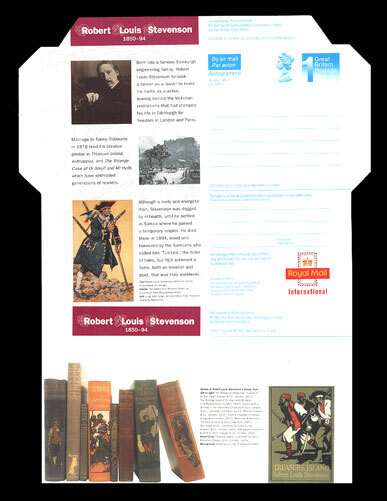 He died there in 1894, loved and honoured by the Samoans who called him 'Tusitala', the teller of tales, but RLS achieved a fame, both as novelist and poet, that was truly worldwide. Spines of Robert Louis Stevenson's books, from left to right The Master of Ballantrae illustration by Wal Paget (Cassell & Co., London, 1911); The Strange Case of Dr. Jeckyll and Mr. Hyde (The Bodley Head, London, 1930); Travels with a Donkey in the Cevennes (Chatto & Windus, London, 1911); Catriona, illustration by A.C. Michael (Cassell & Co., London, 1915); A Child's Garden of Verses (Longmans, London, 1907); Memories & Portraits (Charles Scribner's Sons, New York, 1887); The Black Arrow, illustration by Cyrus Cuneo (Cassell & Co., London, 1915); Kidnapped, illustration by W.R.S. Stott (Cassell & Co., London, 1915). 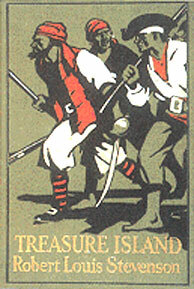 Front Cover Treasure Island, illustration by John Cameron (Cassell & Co., London, 1915).